I really have to impress upon you how very thankful I am that you were able to fill the slot that was left vacant. If I could give you some tangible token instead of just words you must know that I would. Thank you very much because I cannot even begin to repay you. There is more good news too. Daniel has submitted his guest post and I plan to use it if I ever run into a similar situation. Who would believe that half of the year is practically over. July’s guest blogger is Eva626 from Hernownotforeva. I really hope you come back in July to read what she has in store for you. Tomorrow’s Poetic License features exclusive poems from Kymmie. Have you ever wanted to say, “I knew her before she was famous?” If so, meet Jacqui, my guest blogger for June. Jacqui is an aspiring musician and an accomplished blogger. She plays the guitar and promises to one day be famous. Jacqui, now becomes the youngest guest I have had here. Jacqui’s blog, SocialSistersBlog has just reached a milestone of over 50,000 views and she is very happy about that. I thank her parents for allowing her to guest. One month from now we are having a meme and Jacqui has promised to take part in that as well, so you will see her again. As I always do, I ask that you please leave a comment for Jacqui to reply to. Thank you in advance. Hey there everyone! My name is Jacqui! I own a blog called Socialsistersblog. First I just want to thank Tom so much for this great opportunity! At first I wasn’t quite sure what to write this guest post about. There are so many things I could talk about. It was pretty overwhelming and I’m not sure how many people would want to listen to an Aussie girl talk about something that means a lot to her. If you’ve ever read my blog you know that I like to talk about my daily life, music or other things that I find interesting. Music is something very important to me. It can tell a story or talk about life events. Some melodies that have been made are just so beautiful. You know the feeling you might get where a book is so interesting that you can’t put it down? That’s what I get when I listen to a good song. But something that might mean more to me then music or songs is playing guitar and writing my own songs. I play both acoustic and electric guitar. This will be my 5th year of having lessons and I love it! It’s hard to explain my passion for playing guitar. It’d probably come out really weird if I tried to explain it. Haha! I just love the stories songs can tell. There are some songs I can really relate to. Writing my own songs is what I love to do. I guess it helps me express my feelings and thoughts about things. By reading this you might be able to tell that music is my passion? It’s something I’d love to do when I’m older. Of course the chances of me ‘making it’ in the music industry is very slim. You’ve got to have the look, personality/ attitude, and be able to sing (most of the time). It’s a lot of pressure. Sometimes my mind wanders and I think about what it might be like to sing in front of thousands and to have the paparazzi follow you everywhere. People would listen to you, that’s for sure! I wonder what people would think of an Aussie girl who can play guitar, piano and a little bass. I’m not the worst singer out there. Definitely not the best!!! Remember that. Do people even like Aussie accents? I know we say words like ‘laugh’ differently. If I wrote a song with the word ‘laugh’ in it that means people would have to sing it the way I do so it would make sense. The same with ‘tomato’. But I don’t think I’m going to be writing a song about tomatoes… Oh well, a dream’s a dream. Sometimes it can become reality. I hope you’ve enjoyed my post! I’ve definitely enjoyed writing it! Thanks again to Tom for this amazing opportunity! Cya when I cya!! Join me in welcoming this month’s guest blogger, Prinsesa Musang from Prinsesa’s Anatomy. Recently a group of terrific bloggers completed a 30 day blogging journey together and Prinsesa is one of the bloggers. We spent the month learning new things about one another and about ourselves. Now Prinsesa is giving us a glimpse into life in the Philippines. Normally religion is not an acceptable topic for a guest post but this is not about religion, it is about how a particular religious celebration is carried out in a certain country. As I always ask of you, please leave a comment for Prinsesa to reply to. Thank you. I’d like to begin this guest post by saying how silly I felt trying to come up with a topic to write about. It was like there were a thousand things I wanted to talk about and nothing at the same time. :lol: I mean, pooping in your own blog is one thing, but pooping in another’s, is a whole different story, I found out. So with that out of the way, I decided to go with the Holy Week celebrations in the Philippines. I know it is kind of gross but it is really curious. My sisters hate the Holy Week celebrations because they are scared of the practices around town. For sure there are different ways different countries celebrate Easter but here it is quite interesting. There are those who normally take vacations and troop to the beach and visit relatives around this time but others do more interesting things. Is that blood? Yes, yes it is. Are they flagellating themselves until their backs tire of bleeding? Yes, yes, they are. What they use is a set of wooden sticks to hit their backs. A blade is used to cut lengthwise wounds. I have a photo of the actual cutting but I decided not to post it because it may be uncomfortable to some. It depends on the person how many cuts he wants to get: five, seventeen, twenty. Mind you, these are boys my age in the photo. The photo is actually showing my friends doing it. They have been doing this for years. I got the photo from one of them on Facebook. Does this mean all the people in this country are crazy? Not exactly. This is a choice these boys make and many men do actually, always on Good Friday. All the men I know from the place where I live have done it, young and old: Don Domeng, my uncles, my cousins, my friends. My Man has not participated though. He is not from where I live. The church does not encourage this practice. I think this is more of a cultural thing than a spiritual one. I don’t know though because they are the ones doing it and for certain they have a good reason to do so thinking what it takes! My friends said they are doing this because of a panata. It means they are trying to do this in exchange of something they are asking for from the heavens. For example, one might decide to do this in firm belief that in exchange, the heavens will keep all his family members healthy. This is how the story goes for many. Naturally, I am not here to judge them but I am not sure how much bargaining works when heaven is the other party. I admire their faith though. In other parts of the country, there are those who literally volunteer to be crucified. The best part is, I’m not even joking! The most well known place to do this is just outside my province. I have never watched it though. I’m not sure how I feel about it but I’m certain it will be creepy. It takes role playing to a different level, don’t you agree? 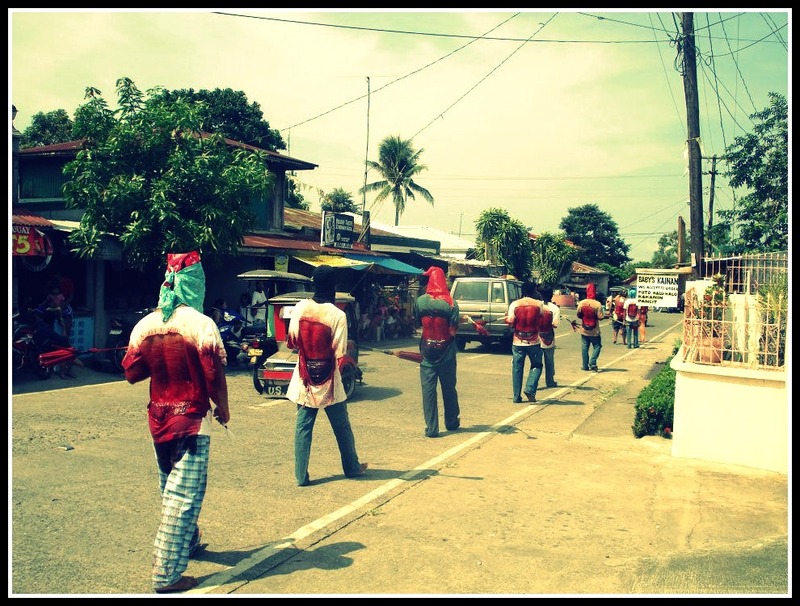 This is just one facet of the Holy Week here in the Philippines. There are a whole assortment of other things happening like the pasyon or public reading of the passion of Christ, people walking around town carrying crosses, and women in black walking around in the heat of day barefoot. This is largely a Catholic country but for sure there are many places who are also Catholic but they do not do anything close to what is being practiced here. Oh well, only in the Philippines, I guess! You are currently browsing the archives for the Guest Blog Post category.